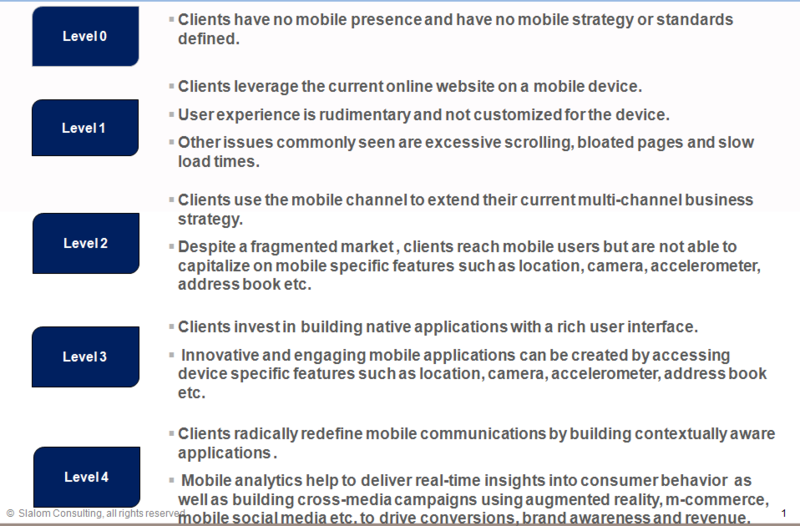 A mobile maturity model describes key practices for each of the maturity levels and provides a framework and an objective criteria for clearly evaluating a brand’s current as well as desired mobile maturity level. Analyzing a brand’s current and desired mobile maturity levels is the first step towards performing a Gap Analysis which helps to identify capabilities of interest. These capabilities then need to be prioritized based on risk, effort and business impact to create an actionable roadmap. – Level 0, Limited Mobile Presence: Level 0 is characterized with limited mobile presence, mobile is not considered core to the business and need for a better solution is not acknowledged by the organization. – Level 1, Reactive and Experimental: Level 1 is characterized by the business reacting to external pressures, need for improvement is acknowledged and pilot implementations exist but overall vision is absent. – Level 4, Optimization and Innovation: Level 4 is characterized by a rich, dynamic, seamless channel experience where continuous improvement and optimization becomes the focus and capabilities drive deeper efficiencies and innovation. This entry was posted in Business Strategy, Channel Strategy, digital strategy, Mobile Maturity Model, mobile strategy, Multi Channel Interactive Strategy and tagged Business Strategy, Channel Strategy, digital strategy, Mobile Maturity Model, Mobile Strategy, Multi-Channel Strategy by Niti Vaish. Bookmark the permalink. Would be good to know about the objective in defining this model? Is this towards assessing the maturity of an enterprise to deployment/use of mobile devices – followed by drawing-up a strategy to move the enterprise upwards on the maturity scale? Or is it to mainly position the enterprise wrt its mobile (channel) sensitivity? If its the former – can you quote cases of enterprises that fall into each segment? As mentioned in the post, the maturity model simply provides an objective criteria to assess an organization’s current and desired maturity level in consumer mobility. It provides a framework for analysts working with the brands to structure their questionnaire and ‘ask the right questions’. Most importantly, the maturity model is at a detailed level to provide true insights to the clients in the gap between the current and the desired state. Please let me know if you have additional questions. Thanks.